This special report and another on African American Equality were solicited by the National Board to enhance the discussion of key racially and nationally oppressed peoples in our country. As special reports to the Baord, these contributions exceed the normal word length of convention discussion contributions. This article is part of the discussion leading up to the Communist Party USA’s 29th National Convention May 21-23, 2010. CPUSA.org takes no responsibility for the opinions expressed in this article or other articles in the pre-convention discussion. All contributions must meet the guidelines for discussion. To read other contributions to this discussion, visit the site of the Pre-Convention Discussion period. All contributions to the discussion should be sent to discussion2010@cpusa.org for selection not to the individual venues.For more information on the convention or the pre-convention discussion period, you can email convention2010@cpusa.org. Our convention document also is key in pointing out how economic issues are the most basic for the political battles and to begin with the program of labor and peoples forces to extend the lifeline for jobless workers. Extend the lifeline for jobless workers. Rebuild America’s schools, roads and energy systems. Increase aid to state and local governments to maintain vital services. Fund jobs in our communities. Put TARP funds to work for Main Street. “a progressive turn in our nation’s politics requires an intensified and broader struggle against racism, male supremacy, and other forms of division. Comrade Jarvis Tyner’s contributions on systemic institutional racism are also very much relevant. The 2008 elections of Barack Obama and a stronger Democratic Party majority in Congress has opened up tremendous opportunity for progress in the struggle for Mexican American equality. Hilda Solis, child of Mexican and Nicaraguan immigrants, is Secretary of Labor; Ken Salazar is Secretary of the Interior; Rep Xavier Becerra is vice chair of the House Democratic Caucus, and Raul Grijalva is co-chair of the Congressional Progressive Caucus. Puerto Rican Sonia Sotomayor is a Supreme Court Justice. There is now a Tri Caucus formation in the House made up of the Black, Hispanic and Asian Pacific American Caucuses and a Quad caucus of these with the Progressive Caucus. 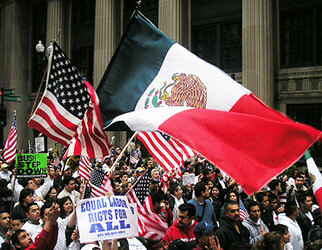 The Congressional Hispanic Caucus has historically initiated a major movement to pass comprehensive immigration reform. These gains are in direct response to the emergence of Mexican Americans as a major factor in transformative impact of tens of millions who acted in concert to defeat the right-wing and move in a progressive direction .There is a growing appreciation of the necessity to advance all people of color in light of systemic racism, making for a political breakthrough in multiracial class unity. The 2008 election was in itself a historic political experience for Mexican American activists from campus, community, and labor. Millions of Mexican Americans, generally ignored or uninvolved, were asked to register, vote and campaign in the primaries and the general elections. Thousands traveled and tens of thousands telephoned to battle ground states. Friends and co-campaigners were off to Los Vegas, South New Mexico, Texas, Ohio, Pennsylvania, Virginia, Indiana. Previously, Mexican Americans traveled to pick crops and fight wars. In 2008, they traveled to change the direction of their country together with other trade unionists and progressives from all communities. The increase in registration and turnout of Mexican Americans was in the millions and record-breaking despite the lack of major campaigning in California and Texas. In the past year these factors were added to in legislative struggles like the confirmation hearings of Hilda Solis and Sotomayor as well as for health care and immigrant rights reforms. And just as fierce battles in state and local fronts. Mexican Americans are heavily involved in the labor upsurge in leading the peoples struggles, indeed the model for many advances have come from the Mexican American-led Los Angeles County Federation of Labor in building coalitions, reaching out to youth, and focusing on unity. The Mexican American-led Federation played the leading role in prioritizing multi-racial representation in recent special Congressional elections, when it successfully supported African American Laura Richardson and Chinese American Judy Chu, over progressive pro-labor Latinos. Organized labor is now a major force for immigration reform and against repression with increased Mexican American participation on all levels in growing numbers of international unions and support for workers centers. In the growing struggles for jobs, pitting workers against immigrants in labor is on the wane and immigrant rights issues are featured at many jobs rallies. Mexican Americans and other Latinos have played an immense role in returning May Day as a labor focus in the US. The AFL CIO greater priority on young workers fits right into the needs of the Mexican American community. Mexican Americans are among the biggest targets of the main fire of the right wing Republican counteroffensive, perhaps best reflected by Phoenix Republican Sheriff Joe Arpaio and the Republican-dominated state legislature of Arizona.. The Republican Congressperson led in attacking immigrants on the health issue to mobilize his reactionary base. The latest move by Texas reactionaries is to strike civil rights from its textbooks where Mexican Americans and African Americans make the majority of the schoolchildren. One of the major Republican candidates, Steve Poisner for Governor of California, has made anti- immigrant policies the hallmark of his campaign. These attacks are in concert with and reinforce the racist attacks on President Obama and his administration. The major campaign appeals of the right have been religious and to the more affluent. Republicans are less popular than ever with Mexican Americans. And that’s where we need to direct the fire and brimstone. The mass movement and rally against Maricopa County Arizona sheriff Arpaio is an example of what needs to be done. Mexican Americans are a necessary force in the struggle to breakthrough the right wing obstructionism and counteroffensive and win progressive changes in health care, jobs and income, immigration, civil rights, labor rights and a more reasonable foreign policy in on going electoral struggles and the coming elections.. Mexican Americans make up over 25% of the population in nearly 80 Congressional districts. They are core constituencies for progressive Latino, African American, white and Asian Pacific American representatives and the key oppositional forces to the right wing. They are vital in many vulnerable Democratic districts, and in areas of smaller population a strong united anti right vote can make a difference in close races. Mexican Americans are strong supporters of the Obama administration’s efforts to move away from the right wing policies of the past and to move for progressive reform as evidenced by the 76% approval rating of California Latinos for Obama, in the January 2010 poll by the California Public Policy Institute. These developments are reflected in the strong races of Rudy Lozano for Illinois legislature, Rick Nagin for the Cleveland City Council and the big victory of Jesus “Chuy” Garcia as Cook County Commissioner in Illinois and Ana Rizo as Mayor of Maywood one of the cities of greatest immigrant concentration in Los Angeles County. Reviewing the changes over time it is clear that by this second decade of the 21st century there has been a qualitative change in the place of Mexican Americans in all aspects of US life that is part of a change of the overall place of racially and nationally oppressed in the Nation. In 1966, racially and nationally oppressed people made up about 15% of the nation’s population; today they make up over 33% of the population. In 1966 African Americans made up nearly 2/3 of the total. Today, Latinos make up roughly 3/5’s of the total. African Americans who make up over 40 million remain the largest single racially oppressed group by far. Their voting strength, history and awareness of democratic struggles in the United states and economic role is also the largest. They are followed by Mexican Americans who number over 30 million whose political, economic, historic and social places are quite substantial. Other Latinos, Native Americans and Alaskans, Mid Eastern peoples, Asian and Pacific Americans make up well over 30 million more. While the super exploitation and much of the systemic racism against Mexican Americans developed in the rise of US imperialist expansionism against Mexico and influenced by the drive to expand slavocracy, it also has roots in racism against the indigenous of the hemisphere and also influenced in policies like the Monroe Doctrine and Manifest Destiny and to play a role in the Pacific Rim. While concentrated in the Southwest, Mexican Americans, after African Americans, are the largest racially oppressed group outside of the Southwest and becoming among the largest of newcomers in most areas including much of the Northeast. . In 2008, the Latino median personal earnings were $21,488, African American 24,951, white 31,570. Puerto Rican and Cuban earnings were higher than for other Latinos, Mexican American and Central American were lower. Mexican Americans and other Latinos are substantially part of virtually every occupation, but overwhelmingly underrepresented in the higher educated, higher income, and from decision making in economics, politics, culture, media etc, and over-represented in the lowest paying and more physically demanding jobs with fewest if any benefits. For every level of education, there is a substantial differentiation between incomes of Mexican Americans and whites, with the smallest differential for dropouts and the largest for those with graduate and professional degrees. At all relevant levels, union membership closes the gap substantially. Mexican Americans workers are severely over-represented in incarceration, and are overwhelmingly the most deported and detained by the geometrically growing immigration enforcement complex. The precise numbers in these statistics are not so important. What is important is the direction the proportion of racially and nationally oppressed in the class and people that has more than doubled and growing geometrically. The struggle for equality is doubly important and more and many times more complex. Mexican Americans, immigrants and native born, are the largest part of that change. Mexican American Actor Edward Olmos says that 2% of the media images are Latinos who make up about 16% of the population. In the media, English speaking, we hardly exist much less matter. This is even more true in academia. One of the most popular social science titles of Chicano studies is “Anything but Mexican.” Ignorance of Mexican American history is an open door to racist right wing ideological attacks and undermines the overall struggles for equality of racially and nationally oppressed and unity of the class and people. Part of the reason is insufficient political, labor, religious, and cultural representation. A huge percentage of Mexican Americans cannot vote because they are not citizens, or are too young. The parents of almost half of our youth cannot vote, and a sizable percentage are legally barred from working. Many are not proficient in English with dwindling funds to learn. Mexican Americans are not concentrated in the historical regions of political and labor clout, the Northeast and Midwest. The struggle for greater respect and appreciation is growing with important support. This is seen, for example, in the success of the campaign to have public television revise a documentary on WWII that left Mexican Americans out, and the removal of Lou Dobbs from national television.. In reviewing the demographic data perhaps the most striking is the youth of Latinos, and African Americans. Mexican Americans’ median age is about 25, Latinos 27, African Americans 31 and whites 41. For Latinos, especially the native born, the numbers are astounding. For native-born Latinos the percentage who are five years old or less is over 8.7. For whites it is 2.8. For the ages of newborn to 19 the figure is 30.4% for Latinos and 11.9% for whites. One in five school children, and one in four newborns are Latinos. Mexican Americans make up over 2/3’s of these. There are lower but corresponding statistics for new voters and entrants into the labor market. This demographic age dialectic is growing in the concerns of Mexican Americans especially when combined with growing political clout but persistent anti immigrant policies and hysteria and stagnating and / or worsening economic conditions and opportunities. Youth play a major role in the legislative, electoral and cultural scene, they are less intimidated by immigration officials, they demand their parents be legalized as well as their co-students in the Dream Act campaigns for flexible legalization for minor undocumented students Mexican Americans and Latinos are heavily involved in the mass movement against cuts in education in California. Though retaining strong identity with their families’ roots they participate in youth culture and struggles with other Latinos, racially oppressed, workers, crossing bridges more boldly..
Immigration heavily impacts the economic struggle. It is against the law to hire undocumented immigrants and increasingly who are not eligible for unemployment and social security compensation. Large numbers of permanent residents are not eligible for safety net programs especially their first five years of benefits. Since the enforcement-only policies of the mid nineties, the organization of undocumented workers is much more difficult, and it has had direct impact on the organization of immigrants in general: Latinos, Mexican Americans and the working class as a whole. Racist immigration law and practices are arguably the primary civil rights challenge in the US in the beginning decades of the 21st Century. The development of a racist system of undocumented immigration as a significant part of the US work force in the latter half of the 20th Century and into the 21st Century increasingly works as a ball and chain on class and democratic struggles of the people. The interests of right wing, Wall Street Republicans is to block any progress in immigrant rights. What if they gave an election and all the immigrants could vote? The fight for immigrant rights is a bitter struggle; even partial victories come with a price. But the fight is on and no struggle is no answer. With the national support of the Party, Comrades Lorenzo and Anita Torres have played historic roles in this work in ideological, economic, and political struggles in the Party and in mass work, in educational and organizational efforts. With their retirement, there is a clear need to carry on their work. In the early seventies, Lorenzo and Anita were called on to focus their work in the key population, economic and political area for Mexican Americans. They spoke the language of the people both in English and Spanish. They worked along with other Black and white comrades like Bill Taylor and Rose Chernin, especially among the young Chicano workers and community, and got active in the mass work and struggle. They then built their work in another key area, Arizona, and dealt with the work on a national basis. They helped Mexican Americans see their future in building coalitions, and fighting for peace. This type of concentration work, in line with our size and organizational capability, is what is needed for continued work. We have to grow the Party among Mexican Americans workers and community, especially the youth , in the work places, communities and campuses around the major issues of jobs, peace, immigration, civil and labor rights. We have to project a real vision of a better future with strategy and tactics that make the difference. We also need to recognize and prioritize the importance of building the Party in Texas with the comrades there. A weakness of the party is in materials on the Mexican American contributions. 40 years ago, International Publishers issued books on Reies Tijerina and the early years of the UFW. It would do good to publish anthologies of our work by Lorenzo Torrez, Evelina Alarcon, Juan Lopez, others, and myself along with those of Jarvis Tyner, Sam Webb, Gus Hall, and Henry Winston…writings from the press, and internal documents as appropriate. We need to have forms to discuss the work nationally, as well as in districts, cities, and neighborhoods. We cannot take the issue of Mexican American equality, and writings and concerted action on Mexican American equality for granted. We cannot leave it for the last minute and not follow up.